1. Start Early. Allocation of time to prepare a proposal is one of the most important determinants of success or failure in winning grants. To enhance the probability of success, we advise that you free up as much time as you can as far in advance of the submission deadline as possible – ideally six months. In so doing, conduct an inventory of your current responsibilities. Anything that can be Dropped, Deferred and/or Delegated (the three Ds) should be removed from your schedule. Consider engaging your chair and/or supportive colleagues about how they can assist you in this regard. For instance, with appropriate planning and coordination, you may be able to find a temporary stand-in for a committee assignment, trade a clinical rotation with a colleague, and/or find a short-term replacement for a teaching obligation. However, start discussing possibilities early as such arrangements are unlikely to be made at the last minute. 2. Be Open. Because the quality of the idea that underlies a grant application is fundamental to its success, you must do whatever is necessary to ensure that you have developed the best possible idea. An essential part of “whatever is necessary” is obtaining critical feedback from your knowledgeable colleagues. If problems exist with your idea for a grant, the earlier those problems can be identified and addressed, the better your odds will be for success. Thus, once you and any co-applicants are confident that you have a well-developed idea for a grant proposal, solicit feedback on your idea from at least two trustworthy “experts” in your field. At the same time, have one or two “non-expert(s)” comment on your proposal, since you may get an assigned reviewer who lacks expertise in the subject matter of your proposal. Then, to reap maximum benefits from your colleagues’ critical review, you must be willing to respond positively to the feedback you receive. 3. Plan to Resubmit. At a time when competition for grant funding is merciless, it is important to understand that your first submission is unlikely to be funded. If you aren’t funded on the first try, try not to get discouraged and be prepared to revise your proposal carefully. Whereas some funding agencies (e.g., NIH) have a formal resubmission process, other funding agencies (e.g., NSF) treat every submission as a separate application. In either case, it is paramount that you pay close attention to reviewer comments in deciding whether your shortest path to funding is likely to be to resubmit, write a new application, apply to a different funding agency, or switch ideas. Finally, be certain to get advice from both your program officer and trustworthy colleagues as you decide how to proceed, and seek their advice again after you have revised the application. 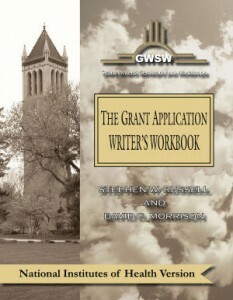 Additional details about these and many other strategies for successful grantsmanship can be found in the different versions of our The Grant Writer’s Application Workbook and our Proposal-Writing Seminars that are tailored to meet the needs of the audience.